Recently AmbientLife was over in the US recording and shooting some client work and whilst we were there we did some test work for a automotive company based in Clearwater near Tampa Florida. 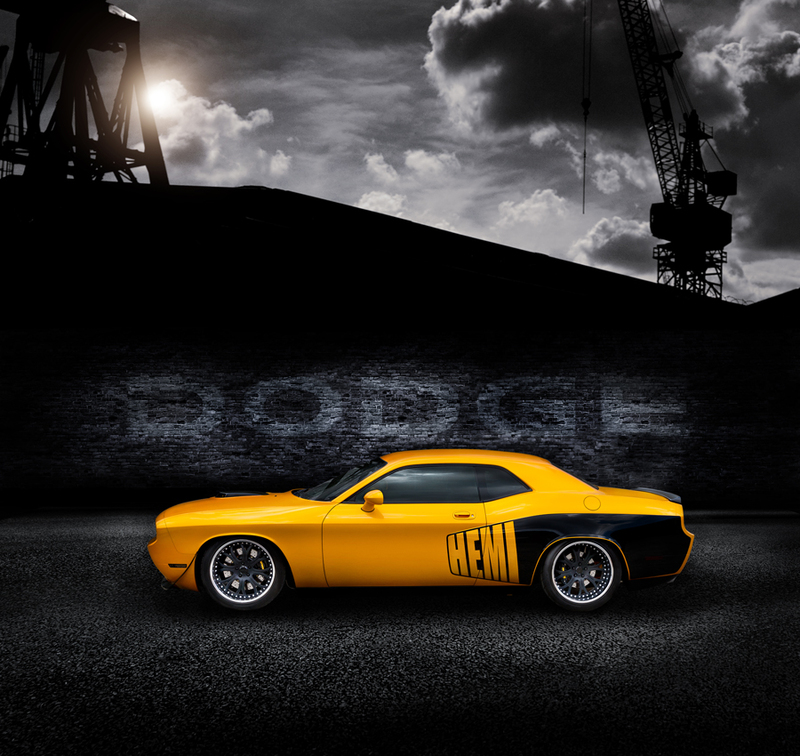 Our task was to create a hard hitting image of a new the new Dodge Challenger. The Challenger is a muscle coupe with a mix of retro style and modern performance. Designed to tie together the past and present, the Challenger competes with its classic rivals, the Ford Mustang and Chevy Camaro. Although the Challenger was on hiatus for three decades, it was a muscle car from the start. The Challenger has remained true to its roots, its two generations spanning a three-decade hiatus yet still looking, driving and performing closely enough to recognize it at the same model. It has always been a great car to shoot photographically and we look forward to spending possibly more time with Dodge in the future to shoot this true American icon of motoring. The Challenger started production in 1970 and has only seen two generations of production due to a 30-year hiatus from 1978 to 2008. The original offered four hardtop models: Challenger Six, V8, T/A, and R/T. A convertible was offered in 1970 and 1971 only. Engines ranged from a 225 cubic-inch six to a 230-horsepower, 318 cubic-inch V-8, a 340 cubic-inch V-8 and the 290-horsepower 383-cubic-inch V-8. All models came standard with a three-speed manual transmission except for the 383 cubic-inch V-8, which was only available with a TorqueFlite automatic. The R/T featured a 383 cubic-inch Magnum V-8, rated for 335 horsepower initially, but later 300 horsepower. The R/T could also be upgraded to a 440 cubic-inch Magnum, a 440 cubic-inch Six-Pack and a 426 cubic-inch Hemi. The first generation of the Challenger ran from 1970 to 1978. The current generation of the Challenger was reintroduced in 2008, with a simplified lineup and engine range: the SE, a base V-6 model with 250 horsepower; the R/T, with a 5.7-liter HEMI rated at 375 horsepower; and the SRT8, with a 6.1-liter HEMI rated at 425 horsepower. This new range was styled to look much like the classic Challenger, though it has grown considerably in size, weighing over 4,000 pounds and featuring 17 to 20-inch alloy wheels. Nevertheless, it provides classic muscle-car feel and performance, with an available five-speed automatic or pistol-grip six-speed manual (manual available on R/T and SRT8 only).